Each graduate has an interdisciplinary one-on-one talk with a principal investigator outside his/her immediate research area at least twice a year. The objective of these talks is to strengthen the interdisciplinary exchange and flow of ideas and to give graduate students the opportunity to take and react to questions and criticism from different perspectives. This will improve their capability to present and explain their work to non-experts. A significant share of the graduates shall stay abroad in another research institute for some time (3 months or longer) to improve on a methodical level as well as to broaden up. This gives graduates the opportunity to both grow as a person and to build and expand their personal network. During the stay, the graduates participate in the research and education programme at the respective host institution. The lecture “Energy Informatics” builds an in-depth understanding of both the basics of energy systems and current trends, challenges and future developments in this area. The course also relates computer science methods to technical and scientific challenges in this domain. Participants will be able to apply these methods when it comes to the challenges of future energy systems. The lecture “Wissenschaftliches Arbeiten und rechtskonformer Umgang mit Forschungsdaten” (“Scientific Practices and Processing of Scientific Data Conforming with Law“) covers principles of proper scientific work and important juridical aspects when working with energy status data. Since it relies on the German legal framework, the lecture is in German. However, it gives insights into the particularities of both German and European law regarding data privacy. Aside from these two lectures, the graduates choose an additional computer science or energy-related lecture from the range of courses offered at KIT that will help them with their respective dissertation project. All graduates and their advisors come together for a two- to three-day retreat once a year. At these retreats, all participants can exchange ideas and bond with each other. The graduates present and discuss their current state of research in individual presentations, poster and demo sessions. The retreat also provides opportunities for interdisciplinary one-on-one talks (as explained above) and open discussions between graduates and advisors. The graduates work together in so-called “Self-Organized Study Groups” on joint projects of their choice. Each Self-Organized Study Group consists of three to five members that work together on a research topic. Ideally, each graduate is active in exactly one SOSG at a time. 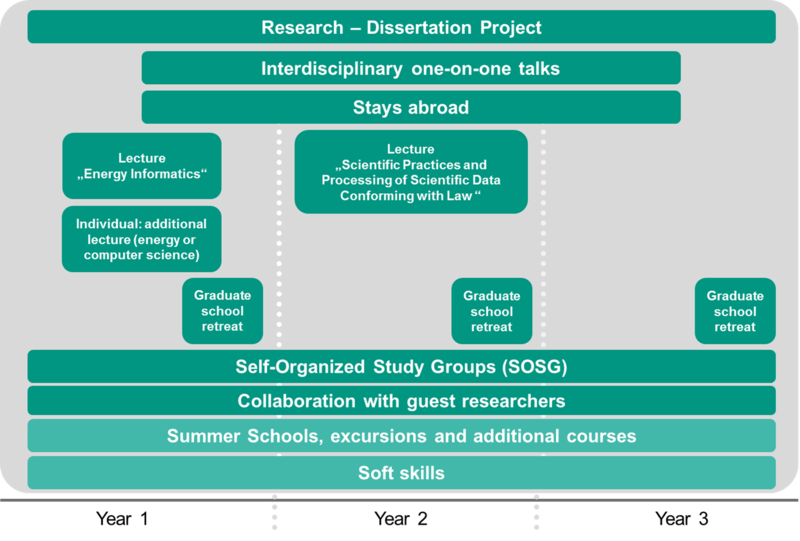 The groups bring together graduates from different research areas and specializations and give way to interdisciplinary work towards a common scientific goal. Because an SOSG is disbanded once the scientific objective has been reached and new SOSGs will form, there will be strong synergies between the graduates, relying on their current joint research interests. We aim to host guest researchers at KIT both for shorter stays (one or two days) as well as for longer stays. The graduates will have the opportunity to get feedback on their research from experts in their respective areas and to work together with renowned researchers. Next, this lets graduates build and extend their professional and academic network and to increase the quality of their own work. By visiting summer schools and other offerings of this nature, graduates can extend both their expert knowledge as well as their methodological skills. Excursions to companies and industry facilities within the context of energy informatics, such as plants or energy service providers, allow the graduates to relate their work to real-life challenges in the energy sector and to expand their respective knowledge. Such visits will take place throughout the entire duration of the graduate school. The graduates shall participate in soft skill courses to improve their qualification regarding, for example, giving presentations, scientific writing, or communication in general. The participation in such courses also is a team building exercise for any cohort of graduates.